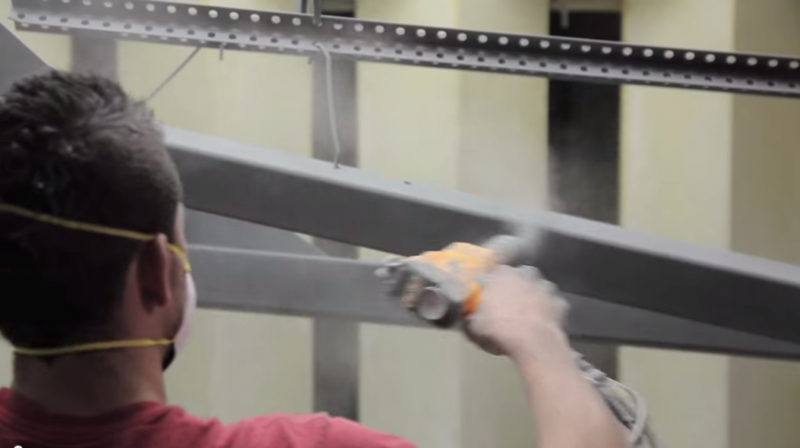 The more you know about your paint spray gun, the better it will perform for you. In this discussion of gun technique, we are talking about how a spray gun is used. How it is aimed, moved and adjusted to achieve different results. 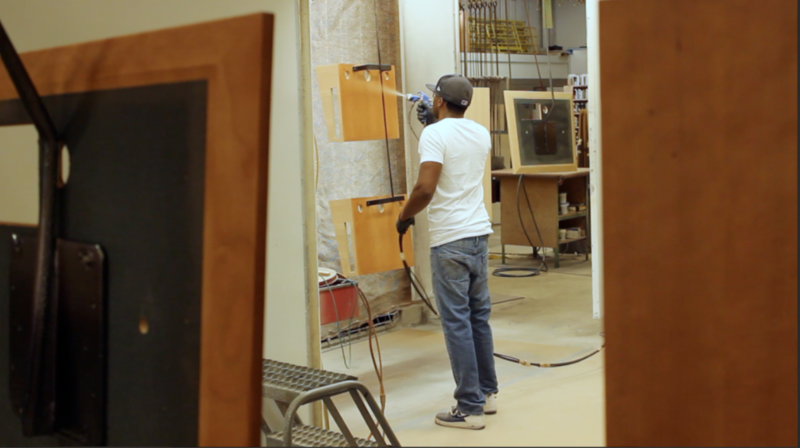 People use spray guns differently and achieve the same results. Changes in air pressure may be compensated for by gun distance or speed, for instance. Gun technique can lead to big differences in transfer efficiency and in throughput (not to mention housekeeping). Spray guns and spray heads are basically the same. Guns are hand-held. Heads are usually mounted on a moving holder such as a chain-on-edge machine or a reciprocator (or a robot). Ok, here we go — on to FAQs on spray guns. What is the purpose of a paint spray gun? 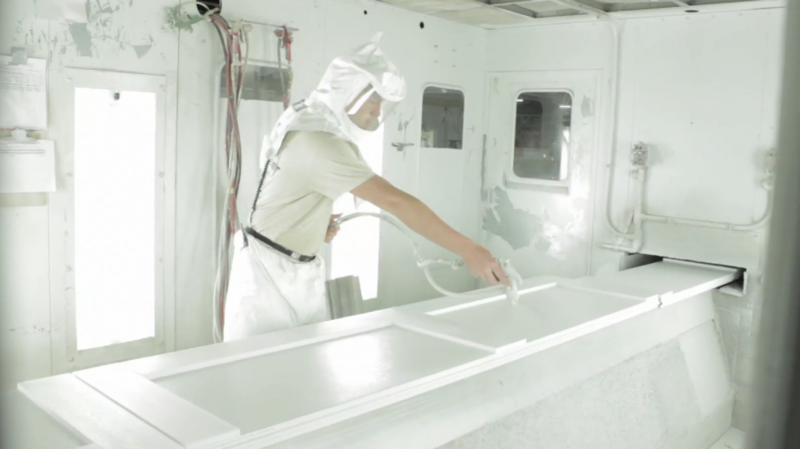 To atomize the paint (break it up into tiny droplets) and direct these droplets toward the part to be coated. Guns should deliver the highest possible transfer efficiency (percentage of sprayed paint that reaches the part). How many kinds of spray guns are there? Several. Convetional, airless, air-assisted airless and HVLP guns are commonly used. Conventional spray guns may be of the pressure, gravity or suction feed type. Electrostatic versions of many guns are also available. Suction feed (also called cup) and gravity guns are not generally used for production work because they rarely hold more than one quart. How is paint usually supplied to a gun? Suction or syphon feed. Cup guns use this technique. The equipment is simple, but the paint-holding capacity of the gun is limited to the cup size — rarely more than one quart. Pressure feed. The paint is pumped to the gun. These guns are used for production work. Gravity feed. Paint flows by gravity to the gun. Usually no external air is used to deliver the paint, although some HVLP gravity guns do use air pressure to enhance paint delivery. Are the various types of guns used differently? Note: Electrostatic guns require at least one inch of distance per thousand volts. Gun speed is mostly a matter of operator preference, although HVLP guns may require somewhat faster movement to avoid flooding. Why are there several types of guns? They must each have advantages for specific uses. Ding, ding, ding. You’re right. Each gun has its advantages and limitations. What are the pros and cons of each gun type? I knew you’d ask. They are listed in the nearby table in very general terms. Cost and maintenance also needs to be considered. Different operators, of course, also have individual preferences. What about electrostatic guns? I see they are not listed in the table. They are not listed because all of the guns listed above are available as electrostatic units. Electrostatic guns use a grounded part to attract electrically charged paint. The result is higher transfer efficiency. Paint usage may drop by 20-50 percent, depending upon the voltage, humidity and, especially, the shape of the part. Electrostatic sounds pretty good. Why are non-electrostatic guns even used? Because the parts must be somewhat conductive and not too complex in shape. Some plastics are not conductive enough for electrostatic systems. Also, the electric field that exists between the gun and the part does not penetrate well into recesses and corners (Faraday cage effect). Thus, complex shapes may be hard to coat. Electrostatic equipment is more costly than traditional systems and may require more maintenance. Low volume shops may not feel the extra costs are justifiable. Usually, however, if an electrostatic system will work, it should be seriously considered because of the increased transfer efficiency. How can I know the best way to use the gun I have? Why not check the owner’s manual? Each gun comes with an instruction book. Perhaps it is not readily available in your shop, but it should be. Find it — read it! If I do find it and read it, what sorts of things will it say? It will probably emphasize the following ideas. Spray at the lowest possible air pressure. Keep the gun perpendicular to the work. Overlap each pass by 50 percent. Trigger the gun at the end of each pass. What is wrong with high air pressure? My sprayers seem to love it. They love it because they don’t buy the paint themselves or clean up their own mess. High air pressure makes the paint droplets too small. They lose solvent too quickly and may not flow-out well on the part. They also blow around too much. Many of them miss the part or bounce off the surface. This leads to excessive paint consumption, messiness and high booth and filter maintenance. How high should the air pressure be? Air pressure can be too high or too low. Excessive air pressure gives a fan pattern shaped like the figure eight (see later question). It is thin in the middle. Low atomization pressure gives too many large droplets. They stay too wet and may lead to sagging. Is there some way to check droplet size? Sure. Just trigger the gun and move it quickly past a nonporous surface like a piece of metal or glass. Moving the gun quickly will separate the droplets so you can see them individually. How do I determine the lowest possible air pressure? Start with pressure you know is too low, then increase it in 5-pound steps. Check the droplet size after each increase. The droplets should become smaller and more uniform. A point will be reached where an additional 5 pounds won’t change the droplet size much but will blow the droplets around more. Go no higher. In fact it is probably alright to back off 3-5 pounds. If you find that more (or less) paint is needed, you will need to adjust the air pressure after changing the fluid flow. Why is the gun-to-part distance important? Because it plays a role in film thickness and wetness. If the gun is too close to the work, the surface may be flooded, and sags or pops may result. Being too far away means the film may be too thin or too dry. Orange peel, dry spray or poor hiding may occur. Why is staying at right angles to the work important? Because if you fan the gun from left to right, or heel it up and down, the result will be great variation in the gun-to-part distance. The droplets traveling the greater distance will both dry out more and thin out more. Unequally wet films of varying thickness will result. Some areas may sag or have the wrong gloss. Sometimes the color may change noticeably. My parts are so complicated it really isn’t possible to stay perpendicular to the surface and at a constant distance. What can I do? Not much. Sometimes the part shapes are not cooperative. Just do the best you can. Good sprayers can work wonders under less-than-ideal conditions if they pay attention to what they are doing, and have enough time. Why should I overlap each pass by 50 percent? In order to achieve an even film build. Actually, you can overlap by one-half, one-third, one-fourth or one over any whole number. The result will be a uniform film build. You should not overlap by one over 2.5 or any fraction with other than a whole number on the bottom. If you do, the result will be unevenly thick regions of the film. It might seem unnecessary, but half of the first and last pass are just coating the air. 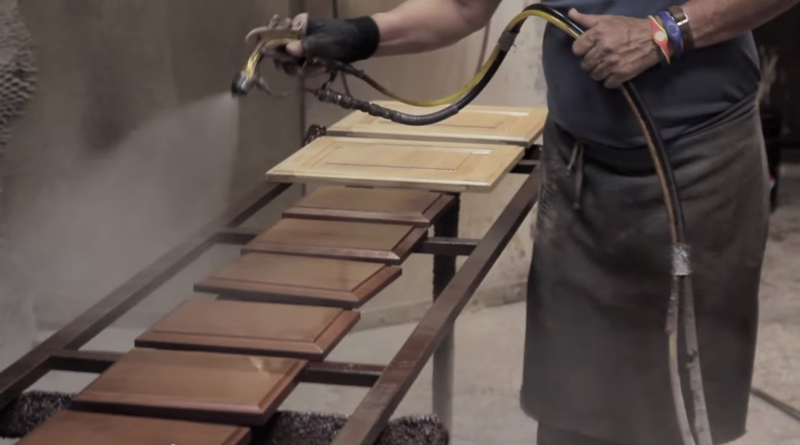 If you don’t coat the air with a half­width of the fan, the half­width on the part will not get a second wet coat. Also, the dry film will be too thin along the edge. What does triggering the gun mean? Triggering means to release the gun trigger (stop spraying) at the end of each stroke. Why should the gun be triggered? To save paint, reduce mess and help avoid excessive film build. If you don’t trigger, you must either carry the triggered gun off the part and then back over it for the next pass, or you must move the triggered gun directly to the next pass while it is aimed at the part. Carrying the triggered gun off the part uses unnecessary paint. 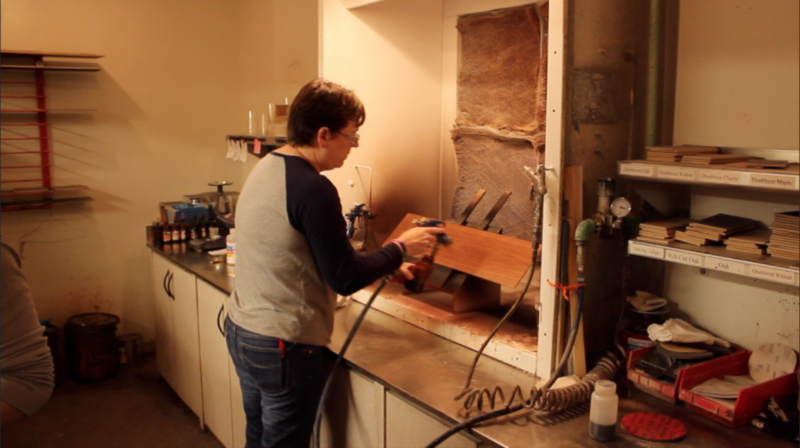 Keeping the triggered gun pointed at the part on the way to the next pass builds wet film at the end of each stroke. The result can be improper gloss (too high), sags or both. Our shop has never heard of triggering. Where did that idea come from? From the gun instruction manual and from common sense. Some paint shops won’t hire a sprayer unless he/she triggers. It soon becomes automatic. Even experienced sprayers can learn to do it. Automatic equipment, including robots, should be set to trigger also, right? What is involved in maintaining the gun properly? Basically just follow the manufacturer’s instructions. You need the gun manual, of course. While in use, just wipe the air cap off now and then with a solvent rag. At the end of the day, use a gun cleaner to clean the inside passages. Lubricate the gun per the manufacturer’s recommendations. Check the atomization pattern once or twice a day. What is the atomization pattern? How can it be checked? The atomization pattern is the shape of the paint fan. It should be round or oval and have a fairly uniform distribution of paint droplets. It is checked by triggering the gun at a nonporous surface such as metal or glass. The uniformity of droplet distribution is checked by holding the gun so that an oval pattern is visible. Do all the forgoing comments apply to electrostatic and airless spray as well as air and HVLP spray? Yes. There are additional considerations with electrostatic and airless however. And just what would they be, for electrostatic, for example? 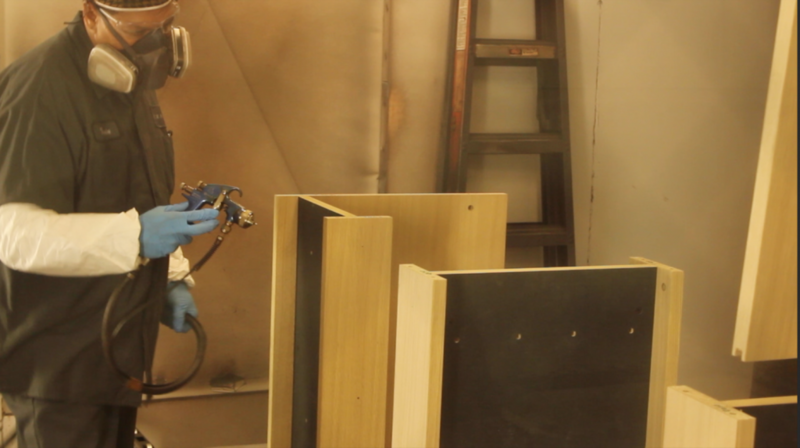 When parts are to be sprayed electrostatically, operators must be grounded so that the electric charge carried by the paint to the part (or to the operator) can make its way back to ground to complete the circuit. By electrical standards, the ground doesn’t have to be very good. Five hundred thousand ohms or less (measured from the part to a good earth ground) is usually adequate. Wow! Five hundred thousand ohms sounds like a lot of resistance. Is that really a good ground? It is when you consider that often less than 100 microamps and up to 100,000 volts are involved. Ohm’s law tells us that such a high voltage can push this small current through a resistance of this magnitude. Can I measure the resistance to ground with any old ohmmeter? No. Because of the very low currents involved, you need a megohmmeter. One that has a 500-volt battery. You said it was important to ground the operator, why is that? So the operator can avoid becoming charged. Remember, the gun is a very efficient charging device. It will impart an electric charge to every nearby conductive object. The operator is nearby, and his or her body has the ability to store electricity. If the operator becomes charged, there is a possibility that an arc could be created between his/her body and a booth ground, such as the floor or the conveyor. Arcs (sparks) in a paint booth are a fire hazard. So how does grounding the operator help? It helps because the electricity (the charge) won’t accumulate in or on a grounded conductive object. It simply is conducted away to ground. This has no effect on the operator — he or she cannot feel it, but it prevents a charge from accumulating on the operator, a charge that could result in an arc if the operator approached a ground. How is the operator grounded? Usually by wearing conductive shoes and or maintaining skin contact with the gun. The gun is always grounded with a wire in the power supply cable. What’s the deal with Faraday cages? A Faraday cage is any recess that the electric field won’t penetrate. Recesses deeper than they are wide are especially troublesome. The electric field won’t go into the recess; it curves sideways to get to the grounded part as quickly as possible. What can be done if the part has troublesome recesses? Experiment with the voltage. Sometimes turning it up forces the field into a recess. The problem here is that if the voltage is too high, an arc (spark) may occur between the gun electrode and the part. We really don’t want sparks flying around in a paint booth. A fire could result. Other times, turning the voltage down (or even off) may help. In this case, the momentum of the paint droplets allows them to break free of the electric field and move in a straight line toward the part, including into a recess. Some guns actually have a power supply off-on switch that allows the operator to easily switch the power off and on. What is the problem with humidity and electrostatic spray? High humidity in the air allows the electric charge to leak off the droplets before they reach the part. It is not a danger, but it is an inefficiency. Wraparound is lost and transfer efficiency goes down. What can be done to overcome a high humidity problem? Sometimes turning the voltage up is helpful. In some cases it may be necessary to dehumidify the booth. How high can the humidity be before it becomes a problem? That depends on the paint formulation. Ask your paint supplier for guidance on this question. What is different about airless spray? The differences mostly have to do with safety. Airless guns use very high fluid (paint) pressures. Sometimes the pressure is in excess of 3500 psi. Pressures like this (even much lower) can cut human skin. Pigment and solvent may become imbedded in the body and cause poisoning problems. Simple laceration (cutting) can also occur. So, what can be done to reduce the hazards? At least three things should be routine practice. Never point the gun at another person. Don’t remove the safety tip that comes with the gun. This tip prevents contact between the gun and the skin. It is a very important safety feature. Engage the safety lock when the gun is not in use. Are you trying to solve a gun technique challenge in your facility? Contact your Accessa Coatings Consultant or call 800-593-0126.